Research activities in instrumentation and microelectronics for the various components of an instrumental chain. It is a CNES R&D that has made it possible to obtain CNES funding. This R&D activity is part of the preparation of future scientific instruments for the measurement of the electric field (upstream technological research, micro-technologies). The aim was to propose a microsystem solution for measuring the electric field from DC to 1 kHz. The MEMS solution has allowed a direct measurement of the electric field, a large miniaturization and a very small footprint. The LPC2E has been developing short electric antennas for several years for the measurement of alternating fields from a few kHz to several MHz. The last achievement of the LPC2E was shipped in 2004 on the ROSETTA comet probe. An antenna type sensor will be part of the scientific payload of the TARANIS mission to be launched by the end of 2019. Several R&D actions have been carried out in recent years to improve the performance of electrical antennas, such as the ASIC solution of the high input impedance preamplifier (see R&D preamplifier antenna). No major improvement seems to be possible without a strong technical break. With this R&T, we have studied the possibility of making a direct measurement of the field, while the current sensors (antenna) deduce the field of a potential difference between two antennas. Preliminary studies for this project have been carried out at the LPC2E as part of Master 2 internships, first, to validate the theoretical aspect of the sensor and, second, to imagine and simulate an architectural concept to meet our specifications. The results obtained encouraged us to continue along this path. Indeed, research continued through funding from R&T CNES and a thesis grant co-supervised with IRIS industry. The thesis also allowed to establish collaborations with the University of Louvain la Neuve in Belgium and with the laboratory IEMN of Lille and the CMP in Grenoble. The scholarship was financed by the Loiret CG 45 general council. Mr. Boujhrarhe’s thesis was defended in 2013. This work resulted in the filing of a patent and publications. 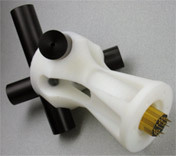 A prototype of the sensor was manufactured at IEMN. This foundry has validated the theoretical operation of the sensor as shown in the figure below. In AC, the sensor “follows” the evolution of the excitation signal but with a phase shift (response time of the sensor), figure (a). The prototype measures a small field of up to 2.8×10-5 V/m. (a) Transient response of the sensor for an excitation of 1 mV/m at a frequency of 170 Hz. 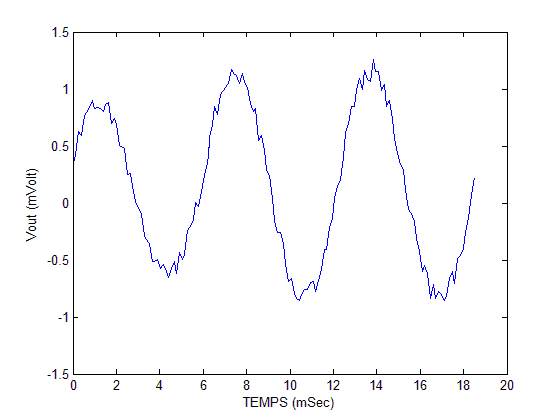 The response of the sensor “stays” flat from the DC to the first pole around 11 kHz, as shown below. This action made it possible to obtain CNES funding and is part of the preparation of future scientific instruments for measuring the broadband magnetic field. The objective is to propose a microsystem solution for the measurement of the magnetic field going from some Hz to 50 kHz. The microsystem solution will eventually replace search coil type sensors (400 g, 20 cm diameter), a large miniaturization and a very small footprint. As part of its research on the ionized environments of planets in the solar system, the LPC2E has been developing for a number of years electrical and magnetic sensors intended to be embedded in satellites or interplanetary probes. Although efficient (sensitivity of some fT/Hz1/2 in VLF-MF) and perfectly meeting the demand in terms of reliability, they remain relatively heavy and bulky, which implies relatively heavy deployment systems too and often complex. An example is the integration of a triaxial search coil sensor on the DEMETER satellite in 2004 as well as on the future TARANIS mission scheduled for 2018. Several R&T actions have been carried out in recent years to reduce congestion and improve the performance of the search coil sensors, such as, for example, the reduction of the size of the magnetic bars and the miniaturization of the reception electronics. However, no major improvement now seems to be possible without a strong technical break. Indeed, the operating principle of this sensor is based on induction and we reach the limits (in terms of sensitivity) that can allow this technique. The emergence of new MEMS technologies as well as techniques based on thin films, especially “spintronics”, make it possible to envisage, in the near future, much lighter and less bulky sensors. In the framework of a CNES founded R&T, we conducted for a few years an in-depth study on giant magnetoresistances (GMR), with the aim of developing a sensor of a few cm3 and weighing a few grams, while having performance approaching those developed so far. Although the results obtained were encouraging (size, weight and bulk) we did not manage to achieve the performance, in terms of sensitivity and noise, similar to the search-coil. 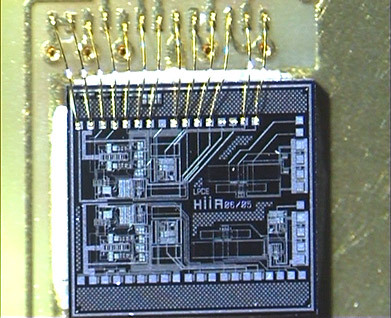 This work has since been taken over, and is currently under the responsibility of a CNRS engineer from LPC2E who continued the developments using this time a spin-tunnel tunnel type sensor. These new developments have resulted in the MAROT project. This is an action that took place upstream of the R&D electric field sensor. Indeed, during the exploration of new technologies and sensors allowing to develop a miniaturized electric field sensor, we then became interested in piezoelectric sensors. Although the piezoelectric solution was not selected for the development of our sensor, we have nevertheless developed a polarization method that improves the electrical response of piezoelectric sensors when subjected to mechanical excitation. At very low temperatures, the electrical and magnetic properties of certain materials such as lead, mercury or some oxides change dramatically. These materials become superconductors: they no longer resist the passage of electric current and expel magnetic fields. Superconductors are already used in many areas: electricity, medical and even space. They are also at the heart of laboratories, in particle accelerators, in the field of astrophysics with bolometers, in ultra-sensitive magnetic sensors such as SQUID, or to produce very intense magnetic fields. However, they must be cooled to very low temperatures. In this study, we discussed the relevance of using cooled sensors in the space domain. We thus gave a snapshot of recent developments in terms of superconducting materials, cooled sensors intended for the space sector, technologies allowing the generation / production of cold, without forgetting to list all the missions likely to embark on the cold. This R&D resulted in a contract with ALCATEL Space for which we provided a prospecting report on this technology for future space missions and a publication. The objective of this R&D is to develop a preamplifier ASIC technology enabling operation of the instrument search coil LF 10 Hz-20 kHz in a wide temperature range. LPC2E conducts research on the Earth’s ionized environment, planets, and the Sun-Earth relationship. Currently and until 2018, the ESPACE team, including myself, is engaged in the production of instruments for various international projects: TARANIS dedicated to the study of the environment of the Earth, Solar Orbiter and Parker Solar Probe dedicated to the study of the Sun. TARANIS is a CNES mission dedicated to the study of the transient energetic phenomena occurring above the stormy zones of the atmosphere. For this space mission, LPC2E is in charge of various onboard instruments: IME-HF (HF antenna measurement of the electric field) IMM (tri-axis “search-coil” magnetometer). Solar Orbiter (SO) and Parker Solar Probe PSP are respectively ESA and NASA missions. The main scientific objectives of these missions are the study of the acceleration of the solar wind, the heating of the solar corona, and the acceleration of cosmic rays of solar origin. For these missions LPC2E has provided the tri-axis search coil magnetometer of the scientific payload (RPW-SCM instruments for Solar Orbiter and SCM for Solar Probe Plus). The development of the search-coil magnetometer is a key issue at LPC2E. Each mission has different constraints and specifications in terms of radiation, power consumption and temperature. For SO and PSP missions, the on-board scientific instrumentation are placed behind a heat shield to protect the spacecraft from very high temperatures. Despite of the shielding the search coils are facing temperature gradient varying between -150° C and 100° C during the mission. So far preamplifier electronics of the search-coils provided by LPC2E can safely operate in a temperature range of -50 ° C to 80 ° C. For SO and PSP the need for operating the search coils in very low temperature environments requires to add a heating line. This heating line alone can consume as much 2W while the typical instrument consumption is about 270 mW for a ± 12V power supply!!! To solve this problem a R&D “Low temperature proofed preamplifier” started in September 2018. The goal was to develop a very high input impedance preamplifier, low noise in ASIC technology. The objective was to improve the measurement of the electric field using electric antennas as a sensor. This CNES funded R&D allowed to design a BiCMOS ASIC circuit in AMS 0.8 μm technology. The foundry was realized via the CMP Grenoble. The obtained circuit has been successfully tested, partly under the supervision of the radio astronomy station at Nançay. This work has resulted in a publication. As part of a feasibility study, we developed a new technique to improve the resolution of analog-to-digital converters. This technique is based on the statistical principle “bootstrap”. The algorithm has been validated under Matlab and the hardware architecture described in VHDL. An FPGA synthesis under MaxplusII environment was performed to evaluate the hardware performance of our algorithm. This study resulted in two publications. In this work, we developed a method allowing the use of a low resolution analog to digital converter (ADC) for a high resolution instrument. Indeed, the use of a high resolution ADC increases the cost of the instrumental chain and limits the bandwidth of the signals that can be processed. From this observation, we developed a method based on the interpolation of the signal from the converter. Using this method we were able to improve the resolution of a 12-bit ADC making it to work as a 16-bit. The interpolation algorithm was implemented on Altera’s FPGA cyclone V target. This work led to the supervision of two master’s students and two publications. Despite their flexibility and economic interest, digital software-based implementation solutions are no longer the only choice for electrical system control design. Indeed, more specific solutions of the hardware type (FPGA, ASIC) seem to better respond to current or future technological constraints. However, despite the advent of tools and powerful CAD languages, these solutions are still too expensive and complex to implement. The aim of the work carried out is to offer electrical system designers an architectural description approach adapted to the constraints of implantation on a material target. Accordingly a method based on the principles of the modular design of Adequacy Algorithm Architecture, and on the development of a library of specific modules, could be developed for different control cases. Thus, the architecture of the direct torque control of an asynchronous motor could be established by following this method and its effectiveness validated by comparing its implementation performance with more conventional approaches to design. Subsequently, the effectiveness of the proposed method was also demonstrated through the case of a “sensorless” speed control of a variable reluctance motor and that of a power electronics device. From this last case of design, a global methodology of modular design mode has finally been developed by developing a library of behavioral models of the control and the associated electrical system. These models have been described in VHDL and VHDL-AMS languages ​​in order to respect the mix (digital and analog) of the elements that make up the electrical system. This approach also makes it possible to predict the case of a mixed integration of the system, thereby opening up broad design perspectives in this field of application. This work has been the subject of several publications and communications. – Availability of microstrip superconducting transmission lines capable of transferring picosecond waves with a speed approaching that of light. – The JJ can be used as switch/ultrafast memory (picosecond). – The JJ can be easily adapted in impedance with microstrip lines which allows a ballistic transfer of the waves generated. Thus, the JJs have a very low power dissipation due to the low voltages used. The elementary RSFQ element consists of an interferometer composed of a Josephson diode coupled with a superconducting inductive element and transmission lines based on Josephson diodes. This architecture makes it possible to transfer or memorize a logic pulse (quanta of magnetic flux) without attenuation or distortion at frequencies of several hundreds of gigahertz (750 GHz) and with an extremely low power consumption (<100 nW/gate). Moreover, unlike the JJ, RSFQ circuits only require a DC power supply. In addition, compared to current CMOS technology, they use a relatively simple manufacturing technology that does not require deep submicron drawing. The state of the art of RSFQ logic shows that this technology is viable for different areas of application. Indeed, we have been witnessing, since the last decade, a significant increase in the number of circuits developed, in the performance level achieved (speed, power consumption, integration density), and also in term of technology (new JJ, submicron technology …). However, in the field of space science, the generation of cold remains a serious lock and this technology has yet to find its place despite the increasing needs in terms of computing power. This R&D resulted in a contract with ALCATEL Space for which we provided a prospecting report on the use of RSFQ logic for future space missions. This work has resulted in a publication.